I posted that if we could find a daughter, of a daughter, of a daughter only descendant, of one of the seven daughters of John and Frankey (Lea) Jessee, we could discover Frankey’s Mitochondrial DNA heritage. This would determine if Frankey has European, Indian or Melungeon origins. Gary Klinedinst, wrote, 7/23/2011, with major news regarding the MtDNA of our Frankey Lea. It was identified thanks to Gary and his mother, Alta Mae Kiser, and their willingness to share their DNA results, and deep Russell County pedigree. Alta Mae Kiser is a direct maternal descendant of John and Frankey Lea Jessee through their daughter, Mary Polly Kiser. We are distant cousins through our shared ancestors, John and Frankie (Lea) Jessee. I am descended from them through my mother, who was born in Russell Co., VA in 1919. Through the intermarriage of cousins, she is descended from this couple through her paternal grandmother’s line, her maternal grandfather’s, and her maternal grandmother’s, so she probably has a lot of Jessee DNA in her. I started researching my ancestry about 30 years ago, and like everyone else researching this couple I ended with lots of speculation and no definitive links to their parentage. I gave up researching them about the time the first Jessee Family Newsletter was written. I had no knowledge of its existence until about a 7 months ago, when I decided to renew my research at the urging of a cousin who found out that I was the family genealogist. I was delighted when I found your website, with its large family database as well as the back issues of the family newsletter. I read each issue from the first to the last. I was very intrigued by all of the findings made over the years, but disappointed when I got to the last issue without a firm resolution of the ancestry of John and Frankie (Lea) Jessee. Now I don’t know whether, since your last issue, you have found anyone who fits this bill, but you have now. My mother’s mother was Hattie Kiser (1887-1983), who was the daughter of Mary Elizabeth Kiser (1859-1928), the daughter of Martha (Childress) Kiser (1828-1906), the daughter of Frances (Kiser) Childress (1805-1887), the daughter of Mary (Jessee) Kiser (1786-1836), the daughter of Frances (Lea) Jessee (ca 1752-ca 1836). Furthermore, my mother is still living and I have had her DNA submitted to both Family Tree DNA and 23andMe for testing for both mtDNA and autosomal DNA. Would you be interested in learning the results? 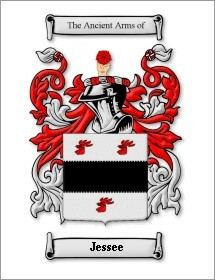 You might also be interested to know that my mother’s father (a Jessee descendant) had one of the traditional Jessee names— Archer. Archer’s mother’s name was Frances (Sutherland) Kiser, named after her grandmother Frances (Kiser) Childress, named after her grandmother Frances (Lea) Jessee. I compared your line of descent with my mother’s and by my reckoning, you and my mother are 5th cousins. Gary provided his mother’s MtDNA results which includes our Frankey Lea Jessee DNA, and reveals her maternal origins and roots. I then did a google search for “H4a1a” and found a site called The mtDNA H Haplogroup Project. This company says H4 is “quite rare,” found in all of Europe except Russia, but highest in Iberia.” However, for the full sequence of “H4a1a,” they just show a map with the British Isles and Finland highlighted in red. Now what can we conclude from the MtDNA results and literature, tables, and maps that I’ve found? Her maternal ancestors were most likely European, although there is a slight chance she could have been descended from Sephardic Jews from Morocco. I also doubt that very many Finnish, Czech, or Polish people were emigrating to America in colonial times. There does seem to be a good chance that her ancestors were from the British Isles. Then again, the high percentage of matches from Portugal could indicate Melungeon heritage. So the mtDNA results are tantalizing, but inconclusive. I welcome any of your thoughts on all of this. Gary wrote later with more information, excellent discussion, and conclusions. Now I would like to discuss what has been learned from my mother’s autosomal DNA, that is the DNA in the chromosomes other than the Y-chromosome and the mitochondrial DNA. I don’t know if you are familiar with the background of this relatively new type of test or not. It turns out that when we inherit our genes from our parents, they are not mixed 100% thoroughly, as I imagined years ago when I was a kid in school. The mixing occurs randomly, but long blocks, or segments, of DNA tend to stick together, often for several generations. People who share identical segments, most likely inherited them from the same person. Of course with each generation, the segments have a greater chance of breaking apart into smaller pieces. Some short matching segments may just be coincidental. But a statistical analysis can tell the difference and predict the degree of relatedness. The more segments you share and the greater the length of those segments, the more closely related you are. Relationships out to the second cousin level are virtually certain to show up. The chance of finding a match with a particular relative begins to decline slightly with third cousins. It can still detect many of your relatives at the fourth and fifth cousin levels and occasionally beyond that. At least two companies use autosomal DNA testing to match their customers with other people that they have tested and to predict their degree of relatedness. Family Tree DNA calls their matching tool Family Finder, whereas 23andMe calls theirs Relative Finder. Another use for autosomal DNA testing is to determine someone’s ethnic ancestry. Both of the above-mentioned companies offer this as a feature of their autosomal DNA testing. Family Tree DNA and 23andMe call theirs “Population Finder” and “Ancestry Painting” respectively. This finding corroborates the mtDNA results that show Frankie Lea as not being American Indian. It also corroborates with your Y-DNA results showing John Jessee’s paternal line to be of Western European descent. WCV (Washington County, VA) WBs (Will Books) 21, 22 and 23 - Published!